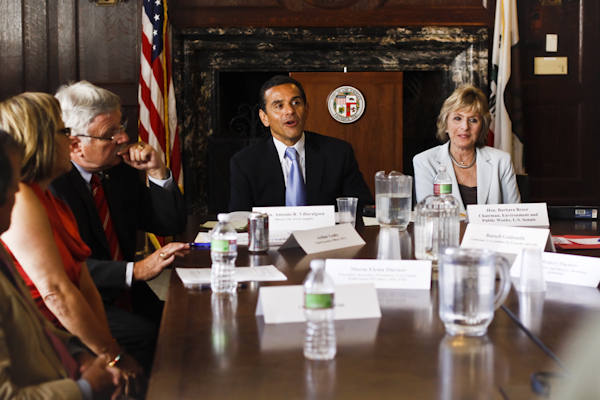 L.A. Mayor Antonio Villaraigosa and Sen. Barbara Boxer at their discussion on the 30/10 Initiative earlier today at City Hall. To the left of the mayor are Metro CEO Art Leahy and L.A. County Federation of Labor Secretary-Treasurer Maria Elena Durazo. Photo by David Starkopf, Office of Los Angeles Mayor Antonio Villaraigosa. Los Angeles Mayor Antonio Villaraigosa and U.S. Senator Barbara Boxer co-hosted a ’roundtable’ discussion on the 30/10 Initiative this afternoon at City Hall in downtown L.A. 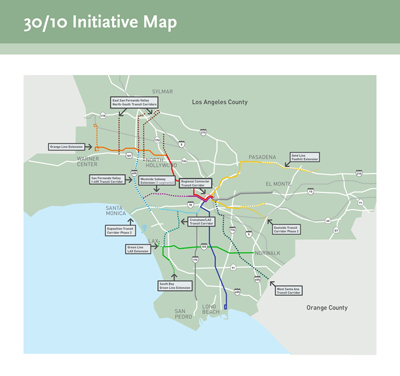 The map shows the Measure R-funded transit projects that would be accelerated under the 30/10 Initiative. Click above for a larger image. The point: talk about progress on the effort to secure federal loans and financing to build 12 Measure R transit projects in the next 10 years instead of the next 30. The projects are sprinkled throughout the county; among them are the Westside Subway Extension, Regional Connector, Crenshaw Line and an extension of the Eastside Gold Line. A lot of the discussion was either technical in nature or reiterated points that attentive Source readers already know: 30/10 could indirectly create a half-million jobs in L.A. County and will likely require Congressional approval as part of the next massive transportation bill, which is likely to be taken up after the November elections. •”We expect to have good news about one of the projects or more getting accelerated within 60 days,” Boxer said, without specifying which project or projects is the candidate. All I can say for sure is that the projects farthest along in the planning stages are likely the most serious candidates and those projects, in alphabetical order, are the Crenshaw Line, the Foothill Extension of the Gold Line to Azusa, the Orange Line extension to Chatsworth, the Regional Connector and the Westside Subway Extension. •Villaraigosa said that in the past few weeks he has meet with House Speaker Nancy Pelosi and for a second time with President Obama and discussed 30/10 with both. He said Obama was aware of the 30/10 proposal and that Pelosi was interested in it as a template that could be used around the country. •Metro CEO Art Leahy said he believes it will help that the Board of Directors of Metro have had three unanimous votes in the past year supporting efforts to plan and build transportation improvements across the county. The three votes were on the agency’s long-range plan, requesting federal money for the Westside Subway Extension and Regional Connector and to support the 30/10 Initiative. •Good point from Sierra Club Chairman Carl Pope: “we no longer have a made in America transportation program.” Indeed, while the federal government certainly does help fund some transit projects, there has never really been a cohesive federal effort to get transit installed in big cities across the country. It’s mostly done by locals on a project-by-project basis. •I thought Boxer also raised a good point saying that with the housing construction sector stuck in a slump, transportation projects may be a good way to create construction jobs. •Other participants in the roundtable discussion included: Maria Elena Durazo, Secretary-Treasurer Los Angeles County Federal of Labor; Russell Goldsmith, Chairman of the L.A. Coalition for Economy and Jobs; Robert Puentes, Senior Fellow and Director, Brookings Institution, and; David Seltzer, Principal of Mercator Advisors. Here’s the 30/10 page on the Metro website.